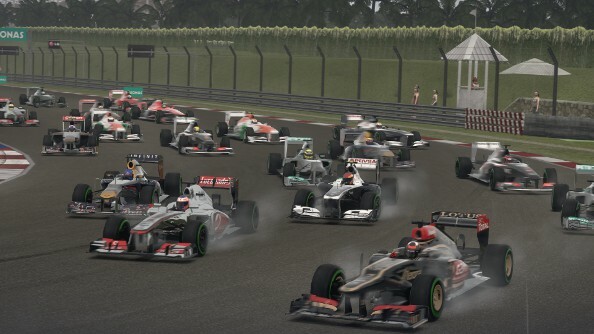 Sports franchises like Codemasters’ F1 series are almost always caught between dull incrementalism and risky revision. With each new edition, the sales pitch inevitably becomes harder, because with the exception of roster changes and updated performance figures, the core game has little reason to change. But bold strokes are dangerous, because they risk alienating loyal fans and creating more problems than they solve. 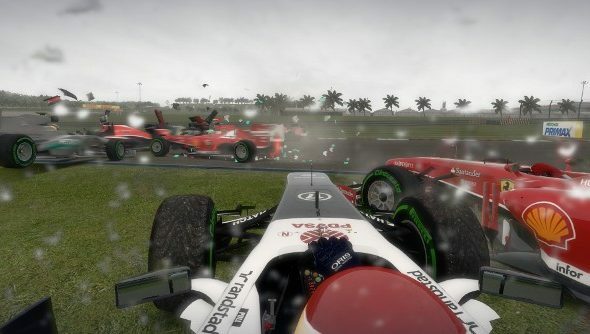 With F1 2013, Codemasters find themselves following in EA’s footsteps, looking to the past as a way out of a somewhat stagnant present. But unlike the historical rosters you find in a typical sports game, racing F1 cars of past seasons actually makes for a profoundly different experience, one that enriches a still-improving, if slightly antiseptic, F1 racing game. Two things have come into maturity with F1 2013. First, its handling model has found a delicious balance between accessibility and volatility. These cars will still get out of control the moment they get too much power, or put a tire on the grass under braking, but they don’t seem like they are actively trying to shake their driver off like a mechanical bull. They respond to inputs with ferocity, but still recognizably like automobiles. Just incredibly sophisticated, aggressive ones. The other major change that dovetails with the handling is the much greater granularity Codemasters have added to difficulty settings. 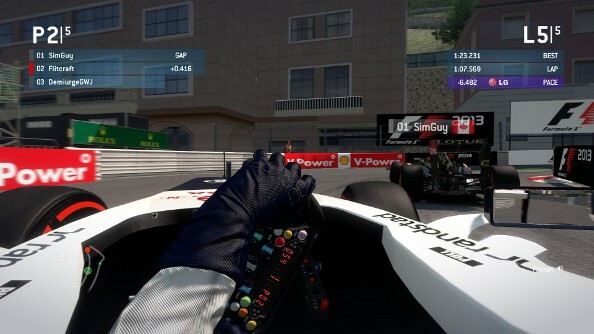 From AI settings to brake assist, F1 2013 makes it easy to find the exact right settings for a budding F1 driver to have a rewarding, exciting experience. Where previous years often had massive disparities when it came to these settings, whiplashing players between over-simplicity and merciless difficulty, this year’s version can manage to be instructive, helpful, and thrilling all at the same time. The assists are so good that, when I was racing in a multiplayer match with a group of PC Gamer writers and editors, it took me a few laps to realize that brake assist had been turned to “low” by the host (don’t worry, you can override this). I didn’t notice because it wasn’t fighting me for control, it was just smoothing out my braking and perhaps adjusting my brake point slightly. Another writer, playing with a gamepad, was able to use the aids to become competitive within a couple races, despite having very little racing sim experience. This is exactly what driver aids should do: help the learning process along without undermining players’ agency. There remains something off-putting about some of the art direction and career mode changes that Codemasters made with F1 2012 and continued with 2013. Everything is just a little too clean and impersonal. Menus are slick and clean, with spotless F1 cars parked in the background inside rooms so sterile and cold that only Ron Dennis could love them. There is something faintly Apple-ish about the way F1 2013 looks between races, a techno-narcissist’s dream of fake brushed steel and cool colors. That’s also the case with the career mode, which has gone from being a nicely personalized “first-person” view of an F1 career in F1 2010 and ‘11 (right down to bland non-answers to reporters) to being a glorified series of performance evaluations and unlocks. There is no sense of there being a real “off-track” existence in the career mode, which actually matters in an F1 game. F1 is a soap opera, with coded messages included in every news clipping. Fernando Alonso never just shoots his mouth off about Ferrari, every “outburst” is calculated. Drivers don’t just get fired or replaced, there are weeks and weeks of tea-leaves to read before that happens. 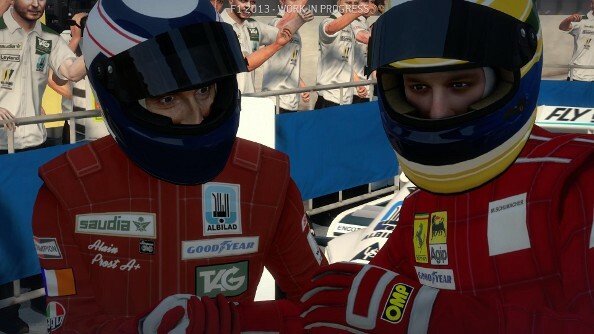 F1 2013 feels largely divorced from that, or from any of the personality that made F1 2010 such a delight. Your race engineer still doesn’t call you by name, as he once used to do, and you still can’t race as a woman, which seems absurd and even crass in a year where Maria de Villota died of injuries related to an F1 testing accident. This isn’t a deal-breaker, since F1 is ultimately about the action on the track rather than the thematic bells and whistles that surround it. But it is a missed opportunity to let players slip deeper inside the role of an F1 driver, to hear their name over the radio, and all the more maddening an omission considering that all these features were in the original 2010 game. As usual, the current-season races and cars are well-realized, though the AI continues to be infuriating in traffic. I can’t count how many times I’ve gotten side-swiped or run off the road by an AI driver who blithely moves back onto the racing line after we’ve gone side-by-side through a corner. While a lot of racing greats have been known to bully their adversaries around the track, F1 2013 drivers just seem too aggressive about risking collisions. With these guys around, I was basically unable to play with full rules enforcement in place, lest I get a time penalty for causing a collision when a Lotus basically impales itself on my nose. The more interesting feature is the historical racing, and it’s just about as good as it seemed when I previewed it last month. But the problem is, it’s very clearly a work-in-progress feature. The classic scenarios are too few and too unvaried to deliver on the potential of the vintage cars, perhaps because there are not enough contemporaries in the selection that Codemasters can currently offer. The grab bag of cars from across the 1980s are interesting to drive in isolation (each one is worth a few hours of time trials) but don’t make for particularly great Grand Prix races. Ironically, they do make perfect multiplayer cars among players of different skill levels. Putting the best driver in a 1980 Williams against a Ferrari from several years later is a great way to even the odds. Multiplayer itself is great fun and features easy matchmaking, although I ran into some significant warping when there was a bit of latency between me and another player. Most of the time, however, I was able to race wheel-to-wheel with other drivers without any trouble. Still, I find myself wishing F1 2013 were not quite so in-your-face about its console ambitions. In a game with tons of car settings to tweak, and a whole lot of menus to navigate, why in the hell can’t I use a mouse? Why do I have to be sitting there poking at my steering wheel to go through certain menus where even arrow keys and and the Escape and Enter keys won’t suffice? I can put up with it, but it’s patently ridiculous. It’s also clear that this is a series that is now being well-and-truly hobbled by current console limitations. The cars look tremendous, but not much else does. Comparing F1 2013 with a game like Project CARS highlights the night-and-day difference between a truly modern PC racer and something running on outmoded technology. Hopefully, with the launch of a new generation of consoles, this series can get a graphical overhaul… and maybe locate someone who remembers how to code for mouse support. For owners of last year’s model, this latest F1 game is hard to recommend, as interesting as the historical cars are. If you’re an annual F1 racer, the chances are a lot of the subtle improvements Codemasters have made here will be lost on you. You likely don’t need driver aids, though better AI difficulty options are helpful as well. But if you’ve been away from the F1 series for a year or longer, or just want the definitive F1 game from this hardware generation, F1 2013 is an easy pick. It is the best this series has ever been in all the ways that count, and historical cars and tracks are a wonderful bonus. And, let’s face it, F1 2013 is probably the only really exciting F1 action any of us are getting in this Fourth Year of Red Bull.